The industry is agreed on one thing – regulatory overhaul is coming. What is less clear is the form it will take, and how that will affect the insurance industry. 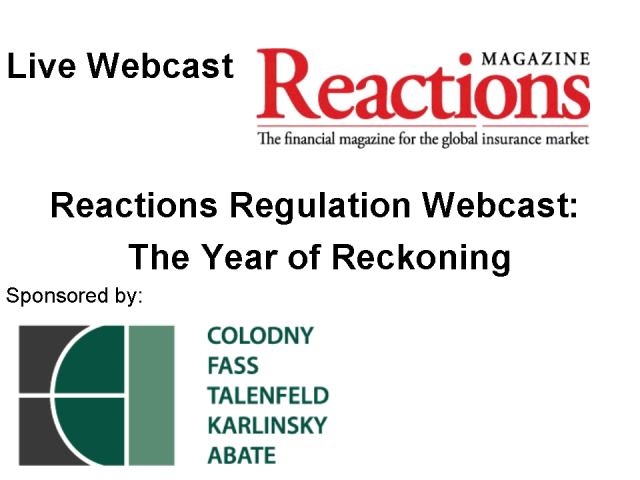 Attend the Reactions Regulation Webcast - sponsored by Colodny, Fass, Talenfeld, Karlinsky & Abate - to make sense of it all. Hear from top lawyers and insurance specialists. - What are the most compelling business opportunities that Insurers can address with Big Data? - How do I make sense out of all this on an actionable basis? - How will Big Data impact the way we do business in 2012 and 2015? - Can Insurers gain a competitive advantage by being early adopters? - How can Insurers take advantage of the collaborative, contextual and predictive benefits of big data? Obtaining these deep insights requires both a strong technology partner with deep business insight to enable actionable analytics to use the Big Data capabilities successfully. TCS is a leading global technology company with a strong Big Data practice and understands the difficulty organizations are facing with this ascending technology and can help clear the hype from the reality. Register and attend for a chance to win an iPad 3. The low frequency of losses in aviation, combined with technical, operational, and legal advances, means that adjusted burn cost methods for rating and analysing aviation do not often provide an accurate indication of future losses. In the current economic climate and with the increasing convergence of insurance regulation on a global basis, insurers face growing risk challenges. These include optimizing economic and regulatory capital, managing risk effectively across the enterprise and providing faster, higher quality financial reporting through improved data integration. Individuals with responsibility for economic capital management and regulatory compliance or who manage risk across the enterprise or within a line of business and who want to implement world class capabilities to better manage risk. Panelists will explore whether the US property-catastrophe insurance market is ready for a big event and how likely one is in the near future. Hear how pricing and capacity is changing, and what effect the political situation in cat-exposed states is having.